As was the case in Barcelona a few weeks back, the Munich XGames were hit with rain that threatened the outdoor events but unlike the Barcelona XGames – the Global RallyCross officials made the call to have the field compete on Saturday for the first leg of the double header. 17 drivers were entered in both Saturday and Sunday’s races so each day would consist of 4 heat races with 4 drivers in 3 heats and 5 drivers in the final heat, followed by the Last Chance Qualifier (LCQ) and the Final race comprised of 10 cars running a 10 lap feature. The Final race field each day was comprised of the top two finishers from each of the 4 heat races as well as the top two from the LCQ. On Saturday, the drivers took to a rainy track for the first heat with Liam Doran, Brian Deegan, Bucky Lasek and Timur Timerzyanov (who was filling in for Travis Pastrana). Timerzyanov held the early lead in the 1st heat race but a late pass by both Doran and Deegan secured their spots in the final while sending Timerzyanov and Lasek (who was never really part of this heat race) to the LCQ. Heat race #2 brought out Tanner Foust, Scott Speed, Patrik Sandell and Guiga Spinelli with Tanner taking an early lead with a great launch and never looking back. Speed and Sandell would battle for second with Speed taking the position; leaving Sandell and Spinelli to go onto the LCQ. Heat #3 saw Sverre Isachsen, Bryce Menzies, Ken Block, Dave Mirra and Mattias Ekstrom take their shot at the “easy” pass into the final race. Both of the Subaru’s driven by Mirra and Isachsen failed to launch as Menzies and his Dodge Dart held the early lead over Ken Block and Mattias Ekstrom. Menzies held the lead until Mirra in one of the struggling Subaru’s conveniently spun and was unable to get back under power so the race was red flagged. Mirra was removed from the race for causing the red flag but the other four drivers restarted. On the restart, Ekstrom launched early and the Subaru of Sverre Isachsen once again failed to launch. Like the first attempt, Menzies jumped out to an early lead over Ken Block and the Dart and Block’s Fiesta quickly pulled away from the rest of the field when – on lap 3 – Block took the lead from Menzies as the two continued to battle door to door for the top spot. Unfortunately, Menzies ran into some technical issues on the 4th lap and left the track which cleared the way for Ekstrom to grab the second spot and the pass to the final race. The 4th heat race of the first Munich XGames RallyCross event pitted Toomas Topi Heikkinen, Steve Arpin, Anton Marklund and Townsend Bell against each other in what would prove to be a very, very easy race for Topi against a trio of drivers with far less experience. Not surprisingly, Topi ran away with the win while Marklund drove to an easy second. In the Last Chance Qualifier (LCQ), 8 of the drivers who failed to make it through to the final race via their respective heat race took to the track for one last attempt to grab an XGames medal. This race included Steve Arpin, Timur Timerzyanov, Scott Speed, Bryce Menzies, Bucky Lasek, Guiga Spinelli, Townsend Bell and Dave Mirra in a 4 lap shootout with the top two of eight receiving the final two entries into the big race. Timur Timerzyanov jumped out to an early lead while his teammate Bryce Menzies battled with Scott Speed for second. Timerzyanov ran away from the field and after Dave Mirra spun out on lap #2 – Speed was able to comfortably claim the second spot. The Final race of Saturday’s half of the RallyCross double header saw ten cars lined up in three rows with Doran, Heikkinen, Foust and Block on the first row; Sandell, Deegan, Marklund and Ekstrom in row two and Timur Timerzyanov and Speed in row 3. Even with the soggy track, all ten cars got off of the starting grid hard in a mad dash for the first corner that resulted in a huge mess that sent Ken Block spinning. The bumper car action continued through the second and third turn as the field began to stretch out with Liam Doran in his new Mini Cooper rally car soundly claiming the top spot as Foust, Deegan and Sandell battled for second. The racing action continued through the second lap with Doran and Foust pulling away from the field until Timur Timerzyanov spun backwards into the wall. He was unable to get moving so the officials were forced to red flag the race. This led to another restart on the grid with all ten cars coming back to the line. As the field launched, the first corner was a mess once again with Doran, Block and Heikkinen coming through the mixup to lead the field. It appeared early in the second attempt at the final that Topi would run away but Doran caught and passed him during the second lap after the restart while Block and Heikkinen battled for second. As the two Fords battled for second, Doran and his Mini continued to hold a big lead until Topi began closing through the middle stages of the race. After Block got too wide coming to the start finish line, it appeared as though it would be a race between Doran and Heikkinen but on lap #5, a flat tire on the left rear of Doran’s Mini seemed to secure his fate but – incredibly – Doran was able to cleanly hold off the Ford of Heikkinen as they battled through the 6th and 7th laps. 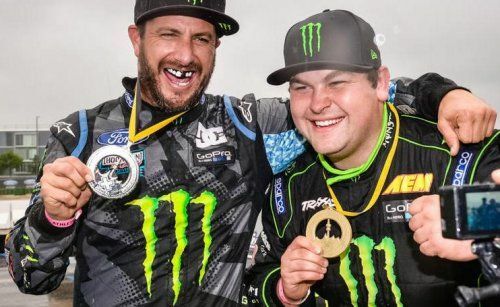 While they were fighting up front, Ken Block was able to catch up and challenge Topi for the second spot while Doran was able to pull away a bit as the leaders crossed the line for the white flag. Block would spend the last lap closing on Doran but he was not able to get around the lame Mini through the final turns. Liam Doran held off the field for 3 laps on 3 tires to win X Games Gold with Block taking the Silver for a 1-2 finish for the Monster Energy teams. Topi Heikkinen claimed the bronze. The full results are listed below along with a video of the full Saturday event so if you have an hour or so to kill – there is some great rallycross action in the attached video. Click here for a look at our coverage of the Sunday GRC race from Munich with video of that racing as well!